Edited by noelscavers, May 23 2016 - 03:01 PM. Having trouble keeping your mask firmly attached to your face? Well then stop being Lewa! Appearance: Same but now he has a fanny pack made of grass. Weakness: If you punch him in his face without his mask on he faints, He provokes Toa and Matoran of ice. Biotron overcame the weakness of not being able to lift himself from the ground but because of the travel that he’s done to Po Wahi he suffered an accident in which his right leg comes off easily from his body. 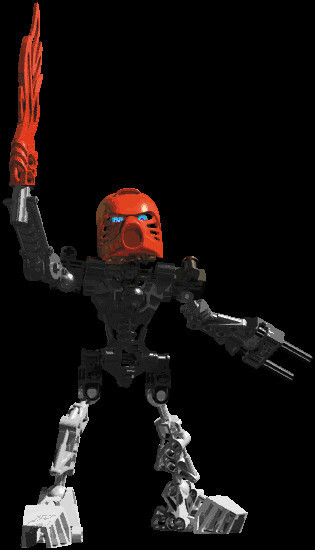 History: Biotron once lived in Ta Koro as a Guard till after an incident he never talks of he was transferred to Ko Koro in witch after some time there he lost his mind and got out of there jumping from a mountain and now he is exploring the island and after arriving at Ga Wahi he meets a group of Toa and a Matoran and they explore the island together until one day a Toa attacked Biotron and he left the group convinced that they were all traitors. Alone Biotron was found by Toa Selos and was subsequently partially cured of his insanity but he escaped and now he is alone wondering the island trying to find Po Wahi. Personality: After being partially cured by Toa Selos he acts more normal but sometimes in bad situations he looses his mind and provokes everyone he also has a distaste to snow. Weapons: He uses a plain disk and a spear that says property of Ko Koro and a shield. Weakness: If you punch him in his face without his mask on he faints, He hates Toa of Ice and Matoran of ice and if you make him fall he cant get up at his own. History: Biotron once lived in Ta Koro as a Guard till after an incident he never talks of he was transferred to Ko Koro in witch after some time there he lost his mind and got out of there jumping from a mountain and now he is exploring the island. Personality: Before loosing his mind he was described as an impatient matoran with a bad temper but even with the bad temper he was good matoran now after he lost his mind he began to hate snow he also has the tendency to repeat or do something wrong he also walks strangely and laughs at the worst moments. Weaknesses: Water, taking away his sword, taking off his mask and using his handcuffs against him. History: Toa Selos was once a bad person until he met Biotron. Biotron gave Toa Selos shelter and subsequently they were both banished from Ta Koro for different reasons. Toa Selos wandered to find a new place so they could live while Biotron worked in Ko Koro and after returning from a long trip he found that Biotron was missing. After encountering a group he finally found him in Po Wahi. Personality: He is an individual who really cares for the safety of people who have cared for him and he is a very positive person and the only reason he was in that deep emotion of sadness was because of a loss for him that came as a Toa friend. Weapons: Disk, that he can use as a shield and a weapon. Weaknesses: Denry can get easily scared if he's going up against an enemy that is bigger than him. He can also lose his cool if he is under stress. If Denry's mask is detached from his head, he'll be in a comatose state. History: Denry is a Matoran from Ko Koro, that has lived in the Koro for many years. Even though he is from Ko Koro he is unaware of the changes that the Koro has been facing in recent times. Denry has lived alone for most of his life ti'll he met some explores in the middle of a snowstorm, after some time he went on his separate way. Personality:Denry has a cooled attitude with little emotion when he speaks, except if he is scared. He can also be a problem solver if he is not under stress. Weaknesses: He loses every time when he loses his disk even if he has another weapon, He faints whenever he loses his mask. History: Denry is a Ko Matoran who has known Ko Koro for almost all of his life. Personality: He used to only care for himself but after everything that has transpired in Ko Koro he acts like he cares but later on that can change. Edited by Tahu3.0, Nov 27 2017 - 06:14 PM. § Appearance: Like all Araka he possesses digitigrades leg’s, long arms small claws and sharp teeth and pupil-less yellow eyes. Konihi is one of the few Araka that’s tall by even Toa standards. He possesses a tree bark skull like helmet with branching horns. His aqua body is entirely covered in light armour, leaving none of his original colours visible. Dark brown armour covers his shins, shoulders, lower arms and chest, with a tree bark-like pattern and tree branch spikes on his shoulders, elbows and knees, the rest of his body is covered by brown and dark green camouflage patterned cloth. § Powers: Teleportation, limited to places Konihi can see or remember well. § Equipment: A powerful Longbow, throwing knives, large hunting knife and a Telescope. Konihi carries agonizing poison that causes burning pain. He has brought a light stone from Onu Koro. § Weakness: Konihi prefers stealth and agility over protection, leaving him vulnerable to most blows. Because he uses cannon bionicle hand absorption to to eat, poisoned food enters his system much more quickly than normal. Konihi’s knows nothing of Mata Nui and refuses to work with rahi. He feels uncomfortable in the caves of Onu Koro. § History: Originating from the home island of the Araka, Konihi was angered by the inability of his people to master their local environment. Growing disappointed with his fellow Araka he set out alone to kill as many local rahi as possible, and managed to rack up an impressive number of kills. Yet as he neared the mountains and legendary monsters that dwelt there, he found that there were limits to what he could do with cunning and stealth. Overhearing talk about a far off island from his fellow Araka, he stowed away on a balloon heading off to the island of Mata Nui. § Personality and traits: Concerned only with defeating the powerful rahi of his homeland, Konihi is neutral to the struggles on Mata Nui caring only for ways to increase his own power. He currently knows little about the island itself but is impressed and envious of the control of the elements that Toa possess. He is dismissive and scornful of his fellow Araka feeling that they are failures for not taming their own land. Konihi hates rahi as they limited what all Araka could do in their land. He has learned how to absorb food with his hands like canon bionicle characters just to avoid eating like a rahi, despite the fact he cannot taste food doing this. Konihi is stealthy and silent, even his teleports are hard to hear. He knows how to set up traps, make poisons and survive in the wilderness, but he lacks familiarity with the flora and fauna of Mata Nui. He is cunning, preferring not to fight until he has stacked the battle as far as he can in his favour and teleporting away when things turn south. Equipment: Wields a heavy single edged sword he’s named the Black Blade, it’s thickness and weight makes it formidable to parry but difficult to wield. He also uses wears two clawed gauntlets that act as his elemental tools. He carries equipment to polish his armour. Weaknesses: Physical weaknesses include a vulnerability to heat, the joints of his armour , his lack of agility and his difficulty in responding to unanticipated attacks. As a toa, His distrustful nature, pride and ambition could be his downfall. History: Beginning as a Ko Matoran historian and a restorer of weapon artifacts. After the defeat of Makuta, Tio encountered what he would name the black blade, and along with it a Toa stone hidden in a tablet found alongside it. He became a Toa that day, continuing his work as a conservator and historian as a hobby. Personality and traits: A thinker and a historian, Tio tends to act dismissive to those he considers unintelligent and keeps his armour and weaponry immaculate to show his status. Tio hides his hatred towards the Great Spirit Mata Nui, The Makuta and any other being of comparable power. This hatred stems from the helplessness he felt under Makuta’s reign. He looks down on those who follow the great spirit and Makuta. As a hobby Tio likes to work on the restoration of old weaponry and interesting artifacts. Tio possesses a lot of strength, but is slowed down by his heavy armour. He fights defensively and can take quite a beating before going down. A detailed description or image: At a height of 10.7 feet Tira stands tall even for a Vortixx even though she does not wear the high heels other vortixx walk in. Otherwise she very much looks like other vortixx with primarily black and silver armour with blue hair and detailing. Powers and/or weapons: see technological items. Weaknesses: Physically she has no powers. She tends to treat Matoran like children because they’re so ‘adorably small’. History: Since arriving on Mata Nui Tira has lived a simple life in Ga Koro, fishing the larger sea dwelling Rahi. Personality and traits: Ever since she arrived on Mata Nui Tira has been haunted by the thought that it was Makuta that brought her people to Mata Nui. She resolved to change herself and subvert the Vortixx stereotype acting as a kind and caring person. She treats Matoran like children because of their relatively small stature. 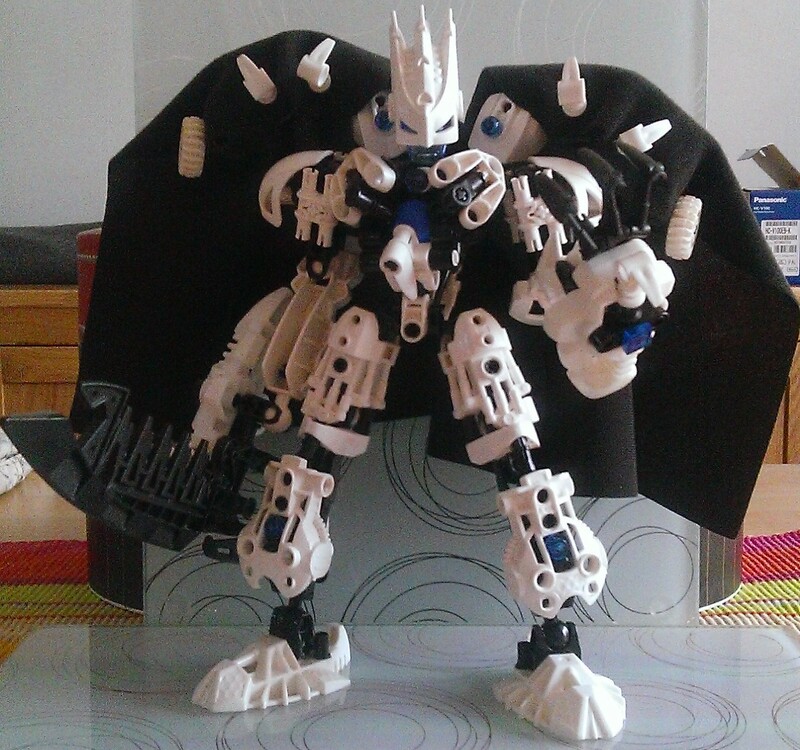 A detailed description or image: A Pure white Mata Nui style Matoran with blue eyes and light blue details on his joints. He usually carries a brown backpack with him. Non Technological items: Rongo carries a bag of medical supplies wherever he goes. Weakness(es): Heat, Rongo isn’t very assertive and prefers to stay in the background. History: Hailing from Ko Koro, Rongo worked as a doctor at the frozen village until he left to give his medical help to the other Koros. During this time Ko Koro was taken over and now Rongo lives in Po Koro, trying to come to terms with the loss of his home. Personality and traits: A selfless but ordinary Matoran. Rongo is passionate about his profession and has taken an oath to save the lives of anybody in need of medical attention. Rongo is a more passive Matoran and tends to let others take charge, but he will put his foot down hard if pushed too far. Edited by Supreme King TIN, Aug 13 2017 - 12:47 PM. As a new user who absolutely loves RPGs, this was the first thing I had to do. POWERS: As a Toa of Sonics, Gairu has the ability to create, control, and absorb sound. Gairu's body is primarily covered with silver and black armor, decorated with green and blue details that glow when he utilizes his sonic powers. He has a plasma burn on his left shoulder, which he got in a fight with a jittery Toa of Plasma. On his blue leather belt are black scabbards that hold his sword and knives. He carries his other gear in a tan backpack. When he's making a dramatic point, Gairu takes to wearing a billowing red cape that he seems to pull out of nowhere. Saber of Alatar- Despite its name, a two-handed Protosteel broadsword with a Gukko feather carved into the pommel. It is capable of channeling and amplifying Gairu's sonic powers. Kukri (x2)- A pair of small fleshing knives that Gairu carries for up-close-and-personal combat. Kanohi Volitak- The Great Mask of Stealth. This mask is capable of shielding Gairu from unfriendly eyes, blending him into his surroundings and muting his noises. It does, however, have a significant drawback. See the Weaknesses section to find out what it is. Red Cape- A red cape with the Matoran letter 'G' emblazoned on the back that Gairu keeps in his backpack. Flash Bomb (x3)- Three small balls filled with flash powder. They don't do anything other than make a lot of light and noise. They're handy for making quick escapes. Fire-Crystal Lantern- An ornate lantern with a glowing crystal at its core. It is said to give enough light to brighten up the bearer's surroundings for up to 100 feet. Gairu bought this lantern from J'erbok in Po-Koro. HISTORY: A Matoran of Sonics is as out of place among Matoran of Earth as a Zivon in the plains. So it was with Gairu. No matter how hard he tried, he could not fit in with the Onu-Matoran in Onu-Wahi. Perhaps it was because of his ineptitude. Yep, that's it; it was his ineptitude. Gairu failed at every task he was given. He kept mapping tunnels wrong; he couldn't put together machinery; and don't get me started with mining. Mining was the last straw. After his failed attempt to mine a cool-looking rock nearly cost the lives of an entire mining crew, the Onu-Matoran kicked Gairu out of Onu-Wahi, along with his cool-looking rock. Alone, Gairu wandered Mata Nui until he reached Kini Nui, the Great Temple. It was there that he found out that his cool-looking rock wasn't just a cool-looking rock; it was a Toa Stone. Placing the Toa Stone on the shrine, Gairu was transformed into a Toa of Sonics! Gladdened by his new abilities, he rushed back to Onu-Wahi, determined to convince the Onu-Matoran that he wouldn't be the cause of any more problems there. He arrived just in time. A dangerous Rahi was going on a rampage, tearing apart several vital mining tunnels. Gairu fought the beast, and managed to beat it into submission, thus saving the underground village. The Onu-Matoran apologized for their rudeness to him and for kicking him out, and expressed their desire to keep him around. Gairu accepted their offer, their apologies, and their friendship. This is where we find him right now, and where I'll be picking up with his new adventures. PERSONALITY/TRAITS: Introverted. Selfish. Cowardly. Again, these are NOT words that would describe Gairu. Gairu is very outgoing and loves to make new friends. He claims it's to make up for the lack of them when he was a Matoran. He enjoys sharing things with those he meets, whether it's a tall tale, something cool he found on the road, or a recipe for Dermis Turtle Soup. He isn't afraid to take on a new challenge or protect those he cares about... mostly. He has a deep-seated fear that he's going to fail, and that his failure will cost the lives of others, due to that almost happening several times as a Matoran. WEAKNESSES: Gairu's sonic powers are weakened in water, almost to the point of uselessness. He is weak against Electricity- and Fire-based attacks, as both will heat up his armor to a very uncomfortable temperature, and he'll need to wait for it to cool down before he continues fighting. He has significant chinks in his armor at the back of the neck and the bends of his elbows and knees. If he gets hit there, he's in big trouble. In addition, Gairu prefers to not use his Kanohi Volitak regularly. This makes most stealth missions hard, because his large self is almost always visible. POWERS: As a Toa of Electricity, Viis has the ability to create, control, and absorb lightning. APPEARANCE: Viis is tall for a female, about five feet nine inches. Her eyes, once a shining, cheerful magenta that matched her heartlight, now lie broken and useless behind a white blindfold. Scars mar her Kanohi Rau’s eyeholes, a testament to the accident that cost her her sight. Her lips are constantly pressed together in a tight line. Viis’ body is primarily covered with shiny, almost translucent blue armor accented with magenta. Atop this, she wears a stainless, calf-length white lab coat, revealing her high-heeled boots. Test tubes are strapped to her belt, along with her Black Blade and Kunai. Tattooed across the back of her hands and neck are Matoran characters, denoting the number “144.” The significance of this number is unknown. Black Blade- A long, black-bladed dirk decorated with magenta. Kunai (x10)- Small black throwing knives. Kanohi Rau- The Great Mask of Translation. It is now useless because Viis cannot see anything that might need translating. Lab Coat- A pristine white lab coat with several pockets. Test Tubes (x4)- Four small glass test tubes strapped to Viis’ belt. Sometimes she confuses them for Kunai. HISTORY: Viis was once a scientist stationed in Ga-Koro. She spent her time cataloguing the marine plants and animals there, figuring out their chemical composition and how they interacted with each other. When she was feeling particularly experimental, she would extract a certain chemical from one species and see how it reacted to a different chemical from another species. These experiments were usually harmless, and produced several intriguing results. Unfortunately, it was one of these experiments that caused her downfall. Viis made the mistake of combining Ruki pheromones with a particularly volatile buoyancy compound found in lily pads. The two chemicals reacted violently, causing an explosion that caught her right in the eyes. Much of her lab equipment was damaged or destroyed, and she was rushed to the nearest doctors. Several weeks later, her wounds had healed, and she was ready to be released, but there was a major complication in the procedures… Viis was left permanently blinded. The doctors tried everything they could to restore her sight, but to no avail. Viis accepted her fate, albeit not without some strong emotion, and went back to her home in Ga-Koro, now a melancholy shadow of her once cheerful self. She decided to take up the art of Unseen Fighting, a combat style developed by those who could not see, because she wanted to at least try to contribute something to society despite the loss of her scientific career. This is where we find her right now, and where I’ll be picking up with her new adventures. PERSONALITY/TRAITS: Viis used to be cheerful before the accident. Now she’s very melancholy and resentful, because her blindness has taken away the thing that brought her joy in life: the ability to do science. She desperately wants to find a solution for her problem, and that means finding a Kanohi Arthron, the Great Mask of Sonar, which will let her sense her surroundings and give her back her scientific career. Despite her almost constant melancholy, Viis will share an occasional jest with a friend if the day is going well. She will also turn quite fierce if someone she loves is in danger, and will try her best to get them out of their trouble, even though she’s handicapped by her blindness and her efforts are only successful about 20% of the time. WEAKNESSES: Viis cannot see. ‘Nuff said. This species needs to be approved by a BZPRPG Staffer before I can play as J’erbok. POWERS: Not exactly a power, per se, but J’erbok has a natural resistance to Water-based attacks and high temperatures. APPEARANCE: Like the majority of the Barcudo species, J’erbok is a beanpole. He is very skinny, with little extraneous flesh on his bones. However, just because he’s skinny doesn’t mean that he’s weak. His muscles, toughened from supposed years of hard labor, ripple under his blanched white, scaly skin. He has an elongated, Alien-like skull, red eyes, and an under-bite that exposes four yellowed teeth. A row of small black spikes lines his hunched back, which match the nails on his three-fingered hands and two-toed feet. J’erbok doesn’t wear much. His only clothing is a ragged tan loincloth, held up by a worn leather belt, and tan cloth wrappings around his wrists and ankles. A yellow crystal is tied around his neck; three more crystals- one red, one green, and one blue- are tied to his belt. He carries a rugged tan knapsack which holds his other stuff. Staff- A long wooden stick patched with metal, with a noticeable kink at one end. Two pink crystals are tied to the bend of this kink. J’erbok primarily uses it as a walking stick, but it doubles as a blunt weapon in a pinch. Crystals- Several crystals of various colors that J’erbok carries with him. They are supposedly from his home island. They don’t do anything special; they just look pretty. And they sell for a good price. Oddities and Bric-a-brac- The name says it all. J’erbok keeps his knapsack full of various trinkets and other small objects that are also supposedly from his home island. He peddles them whenever he’s running low on coin. HISTORY: J’erbok hails from a faraway island with no name. He doesn’t remember much about it, other than it always seemed to be in a state of turmoil. The reason he doesn’t remember much about it is that he was conked on the head hard and woke up Mata Nui knows how much later in a sea-bound crate with amnesia and a knapsack full of stuff. This crate, battered and broken, eventually washed up on the shore of Po-Wahi, dumping him and his knapsack on the sand. When he regained consciousness, he began to wander the desert, wondering where he was and if he could find someone to help him. He reached Po-Koro a month after, and opened up his own curio booth in the city. This is where we find him right now, and where I’ll be picking up with his new adventures. PERSONALITY/TRAITS: Despite being stuck in that crate for so long, J’erbok is actually pretty smart. He knows how to survive in harsh environments, which is what kept him alive in his wanderings. More importantly, he knows the value of money. J’erbok has a desperate need to be liked. He’ll always try to impress others with a (made-up) story about something awesome he did, in order to hide the fact that he doesn’t remember his past. Most of the time, people believe his stories, which is why he fears that if they found out that he was lying, they’d stop liking him. He walks with a limp and sounds like Sean Connery. WEAKNESSES: J’erbok is easily distracted. That’s not a good thing to be, especially in combat. He’s also not the best at combat, has no armor or real weapons, and tends to break his staff if he swings it at something too hard. APPEARANCE: Nikonn stands five feet five inches tall, and manages to look quite regal at that somewhat lacking height. She has pale blue skin, vaguely reptilian facial features, and silver “hair” styled in the traditional swept-back Vortixx fashion. Her curvy figure is the envy of other Vortixx females, and desired by males of all species. Nikonn clothes herself in a tan bra-like garment with a chocolate-brown fur collar, tan, knee-length cargo pants, tan cloth wrappings on her wrists and feet, chocolate-brown fur bracelets and anklets, a chocolate-brown cloth belt, and silver armor on her biceps, belly, and shins. All of these, bar the fur, are trimmed with a shade of aquamarine that exactly matches her eyes. Zamor Spheres- An assortment of Zamor Spheres of various powers, including Targeting, Freezing, and Binding. Nikonn uses them as projectile weapons, but see the Weaknesses section to find out why they usually never work. Spear of Siphoning- A spear with a weakened Siphoning Zamor Sphere in the head, intended to steal others’ powers. Nikonn uses it, or attempts to use it, when she knows a fight is coming on. That prevents her opponents from using their full powers on her, so she can effectively manipulate them without worry of getting burned entirely to a crisp. It doesn’t work instantaneously; instead, it will draw out her opponents’ power a little at a time, usually taking fifteen minutes to do significant damage. Makeup Kit- A set of exotic Vortixx beautifying products, including Bula berry extract (hair conditioner), Madu fruit paste (mascara), and Visorak poison (exfoliating cream). This gets the most use, because Nikonn knows that her beauty is what makes males bend so easily to her will. HISTORY: Born into a high-class, well-respected Vortixx family, Nikonn was taught from an early age that she could and should have whatever she wanted. For Nikonn, what she wanted was knowledge. She kept her nose in all the books that her parents’ money could buy, retaining every piece of information that she read. Her parents were proud of her growing intellect, and encouraged her to pursue her quest for knowledge. As she grew in intellect, Nikonn grew also in age and beauty. Males, not just Vortixx males, but males of other species as well, began to take notice of her and desire her. And why shouldn’t they? After all, she was very smart, very beautiful, and (most importantly) very single. But Nikonn would not return their affections. No, her only affections were for her books and scrolls. Eventually, Nikonn exhausted her parents’ supply of knowledge and left to seek out new books, new scrolls, and new information. (Her parents were secretly glad that she was gone, so that they could sell the massive pile of books that she had bought with their money.) Her quest led her to the Ko-Wahi Academy and Hospital, the largest knowledge database on Mata Nui. She practically took up residence there, up to her neck in new subjects and new information on familiar ones. For a time, she was happy. Then Echelon came into power in Ko-Koro, heralding in the arrival of several unsavory characters. Nikonn was the target of much harassment from said unsavory characters, who claimed that a beauty like herself shouldn’t be wasting her time with becoming smarter; instead, she should be off somewhere else getting married. Nikonn couldn’t stand this harassment for very long, and after three days of putting up with it, she left Ko-Koro, determined to stay away until something was done about the harassing riff-raff. This is where we find her right now, and where I’ll be picking up with her new adventures. PERSONALITY/TRAITS: As a result of her high-class upbringing, Nikonn is very graceful and deliberate with her movements. Her actions are always purposeful, and she makes no unnecessary movements. Even her habit of toying with her hair has a purpose. Males love that about her. They also love her throaty voice and her other deliberate habit of rolling her ‘r’s in a seductive manner. Combine those with her beauty and brains, and it’s no wonder that males go wild for her. Nikonn is a master manipulator, a skill she picked up from her influential parents. She’s only had to manipulate a select few people, as others will generally fulfill her requests without question or resistance, especially if those others are males. But when she does have to manipulate people, she does so flawlessly. As such, she almost always gets what she wants. Almost. WEAKNESSES: Nikonn’s greatest weakness is her vanity. She knows how beautiful she is, and recognizes the value of it when manipulating others, which is why she’ll go to great lengths to preserve it. That generally means staying away from a fight. If she has to fight, or if she can’t get to her Spear of Siphoning fast enough, she’ll usually stay reserved and never get fully involved in it, which is bad if her opponent is a willing pugilist. She’s also terrible at throwing her Zamor Spheres. POWERS: As a Toa of Iron, Aiduro has the ability to create, control, and absorb any kind of metal and similar substances. APPEARANCE: Aiduro is a mountain of a Toa. Seven feet tall and covered in bulky, fur-lined armor, his silhouette is enough to strike fear into the hearts of lesser beings. His armor is colored silver and burnt orange, pointing to his status as a Toa of Iron. Aiduro’s eyes burn a dark blue behind his Kanohi Pehkui. A gray woolen scarf wraps around his neck and shoulders. Gray fur is visible along the edges of each piece of his armor. His gray leather belt holds his equipment. Scars in the shape of teeth marks mar his left hand. Epilogue- Aiduro’s massive Protosteel broadsword. Where the blade meets the handle, a Mahi head is sculpted into the material. The Mahi’s horns form the ends of Epilogue’s crosspiece. Tangler- A large net made of thick rope. It is used for entrapping Rahi and opponents alike. Kanohi Pehkui- The Great Mask of Diminishment. Aiduro never uses it; he’s quite proud of his imposing figure. This mask was briefly lost in Ko-Koro to the Collector, then returned. Ogden’s Old- A seemingly bottomless bottle of strong, Ta-Koro-brewed whiskey. Aiduro is never without it. HISTORY: A bartender. A Rahi tamer. A sell-sword. A guardsman. Aiduro has been all these things and more. He’s lived for adventure since his birth, doing anything that involves roughing up something else. Aiduro’s first career was as a bartender in Ga-Koro. The shady bar was primarily run by gruff and tough Skakdi, so the environment fit perfectly with Aiduro’s rough-and-tumble personality. (The environment was also where he developed his propensity for drinking booze and harassing girls.) He was the best at clearing up fights and clearing out riff-raff, but when one unsavory character turned out to be the off-duty manager, he was fired. Rahi taming was a logical second choice. He began to hunt Rahi all across the island, wrapping them up with Tangler and whipping them into shape. It was during this time that he forged Epilogue. While the income for Rahi taming was good, Aiduro just wasn’t sure what to do with the Rahi once they were tamed. After a particularly disastrous incident with a Kavinika, he went looking for another job. Aiduro briefly took up a career as a sell-sword, but sell-swords weren’t very much in demand. When he found out that he could make an even better living out of roughing up others as a guardsman in Ko-Koro, he went straight to Echelon and applied for the job. Echelon accepted him, and stationed him at Glacier Gate, where he has stood guard ever since. This is where we find him right now, and where I’ll be picking up with his new adventures. PERSONALITY/TRAITS: Aiduro loves to harass others, be they Rahi, Matoran, or otherwise. He makes a tremendous joke out of it, which makes his harassment worse and increases his enjoyment of it. Most of it is a byproduct of drinking too much Ogden’s Old. He doesn’t care, though; he’ll just keep on drinking and harassing. WEAKNESSES: Aiduro is deathly afraid of Kavinika. His hand still bears the scars from that one encounter. He also utilizes a reckless fighting style that will often leave him vulnerable. Edited by capMARVELOUS, Apr 08 2017 - 10:26 AM. I think this might be my first post on the entire site. Powers and Weapons: Can create, control, and absorb Plasma, can form part of a protodermis cage, and produce a Plasma Nova Blast. He carries a greatsword and a large Rhotuka-launching kite shield. His unique Rhotuka power is Sensory Scrambling, which causes an assault on the target's senses of sight, sound, and touch, momentarily stunning them. Technological items: Kanohi Kadin, Great Mask of Flight, carved in the shape of a Kiril for reasons he no longer remembers. Weaknesses: Powers are tempermental at times. Vulnerable to mental powers. Aggressive and short-tempered, but lacking in real confidence, often causing him to defer to others whenever possible. Mechanical parts make him especially weak to Fe- and Fa- elementals, along with the usual elemental weaknesses of his element. While his mechanical parts are stronger and tougher than biomechanical ones, his feet are smaller and less stable due to a lack of proper toes, and his hands are much less dextrous- He mainly keeps his grip on things by trying to lock his fingers closed around whatever he is holding. Any parts of his scarred body that are exposed are very sensitive to touch. He is partially aquaphobic, becoming unnerved around large, deep bodies of water. History: Arcan was once a hero in his own land, until it was attacked and conquered by a mysterious and powerful warlord. With his allies and comrades dying around him, his people being slaughtered, he engaged the warlord by himself, but was no match for her power. In desperation, he unleashed his Nova Blast, only to have his powers disrupted by his foe's Kanohi, a strange one he had never seen before, causing it to badly injure him. His body was recovered, and the warlord stabilised him, gave him his mechanical parts, and attempted to brainwash him to use as a weapon. However, the being in charge of a latter, a Toa-like one with psionic powers (Generally assumed by him to be a Dasaka, though the topic was never brought up) instead chose to free him. The two spent some time together and grew to value each others' company, but one day, his friend disappeared. Distraught over her loss, he has since wandered the world, searching for her. His search has brought him to the island, unaware of what he is about to land in. Personality and traits: Arcan is cynical and somewhat rude, and projects an antisocial aura that belies his true lack of confidence. Despite this, he possesses a brave and noble heart, and he will be more than willing to leap into action to protect those he holds dear. While he is detemined to locate his mysterious friend, he cannot turn a blind eye to the needs of the people wherever he ends up. He knows that distractions make his chances of locating his friend more and more slim, but he accepts that he would not want him to sacrifice others to try and find her. Some details of his life prior to his augmentation are lost to him, including the reason for the shape of his mask. Edited by ToaArcan, Aug 27 2016 - 12:34 PM. Here's my first character. Possibly more to come. APPEARANCE: Hakura has an average fit masculine build that one would expect from a young but experienced Toa. His eyes are blue like superheated fire. His armor contains the entire range of colors between black and white, with his upper body armor gravitating towards black and darker greys, and his lower body leaning towards lighter grey with white greaves and boots on his feet. One can almost say that his armor starts black on top and fades into white towards the bottom. He will typically wear red masks. Here's a roughly-edited picture of him. Just pretend he's channeling plasma through his sword at this moment (his weapon does not look like a flame sword). POWERS: A Toa of Plasma, Hakura can create and control superheated plasma, and is naturally resistant to heat, similar to Ta-Matoran. He typically channels these powers through his Heat Falchion, though he can simply channel it through his hand if need be. Due to the mask he wears, Hakura can create a forcefield around himself which is immune to physical attacks, however it only protects him from attacks that he is aware of. PERSONALITY: Hakura is an overall easygoing Toa, but knows when to take things seriously. His temper is not particularly short, though this often changes in battle, where he can often let his more primal emotions take over. When outside of battle, he has an easy time making friends, and always gives people the due respect that he believes they deserve. However, when around people that he does not like, he loves to mock them and suddenly gains a sarcastic streak. Though some may say that Hakura has many conflicting personality traits, he would tell you that he is always true to himself, but that he just shows different sides of himself depending on who he is around. When around a female Toa or similar species (Dasaka, Lesterin, etc) that he finds attractive, Hakura is often known to put on a sense of bravado, though it is rarely if ever intentional. Despite this, he still tries to show the best sides of himself. HISTORY: Formerly a Su-Matoran, Hakura spent much of his time on Mata Nui in Ta-Koro, feeling at home in the heat. Because of this and the close bonds with the Ta-Matoran, he practically came to consider himself a Ta-Matoran, and would sometimes forget that he wasn't. When he became a Toa, he continued working for the guard, but he rarely left the village. He eventually decided to go his own way and protect those he cares about on his own terms. His sudden thirst for adventure also prompted him to do things his own way. Wanting to broaden his own horizons, he has moved onto Po-Wahi. Though it was not quite Ta-Koro, the desert heat was still comforting to him, and he felt that living out in the wide desert was better than being cooped up inside a volcano. He has grown attached to the Po-Matoran as well. WEAKNESSES: Hakura gets nervous from extreme heights, though he wants to work on overcoming this fear. Whenever he gets frustrated, his fighting technique starts to deteriorate, and he may resort to brute strength, even when the opponent is stronger than him. He can also easily become so focused on one goal to the point where he forgets everything else, and his closest friends worry that this could lead him down a dark path. If he messes up in front of a beautiful female, his pride becomes much more easily hurt. FUN TRIVIA FACT: Hakura is a throwback to my Bionicle-loving childhood, and was my very first OC ever. I came up with him in 2003 as a McToran with a black upper body, white feet, and red Hau...but he was supposed to be a Ta-Matoran. Why my little 8-year-old self chose that color scheme beats me, but it stuck, and I rebuilt him as a Toa after watching Mask of Light. Now that I'm back into Bionicle, I've retconned him as a Plasma Toa with a strong connection to fire elementals, since his color scheme is much more plasma than fire. But he's essentially the same character. Edited by Hakura: Toa of Plasma, Oct 20 2016 - 09:13 PM. GENERATION 4: The first time you see this, copy it into your sig on any forum and add 1 to the generation. Social experiment. 92% of teens have moved onto *insert popular music genre you don't like here*. ...So? Get off the high horse and let people like what they like. Weakness : He is vulnerable to loud noises, his golden/bright green armor also makes stealth difficult. History : None he washed up on the shore with no memory of who he was or what he was supposed to do. He came of with the name Yert after hearing something make that noise when he woke up. He feels like he was sent here by someone for a reason. After his first encounter with water he almost drowned. He has since decided that he hates water. Edited by Medalis, Jul 12 2017 - 10:27 AM. Equipment: Zarisk always has at least two pairs of silver knives at his side, for throwing and for stabbing and slashing. He's also held onto the strange gauntlet he woke up with on the beach, despite not yet knowing of it's nature and use. Abilities: Quick on his feet, Zarisk is agile and swift for a Skakdi of his size. Stealth is his strong point, and he has no shame in avoiding a fight unless the need arise. Not however for lack of capacity to win, having mastered the use of his twin knives in melee and ranged combat. Weakness: His biggest weakness is against more resistant enemies who can take more of a hit, and give one too in close quarter combat. He's also not most effective against ranged enemies out in the open, preferring to stick to the shadows. Personality: Zarisk is often said to be emotionless and cold blooded. Not much can be seen through his piercing blue eyes. Edited by Zorkaz, Feb 10 2017 - 02:10 PM. Description: Masculine presenting and of average build. His body is colored smoky grey, black, and tan. He wears a powerless mask in the shape of a noble komau. Always has a pair of soft black gloves on and a book tucked under one arm. Powers: a sharp mind and the innate constitution of a po-matoran. Weaknesses: His fingers were permanently mangled in a climbing accident. He covers the scars by wearing gloves, and relies on others for basic tasks. He also suffers from seeing things that aren’t there. Personality and traits: Inquisitive. Doesn’t talk much about himself, but loves learning about others and gossiping. Edited by Unreliable Narrator, Nov 12 2018 - 12:50 PM. Description: Hakava is a man with a wary demeanor, and he appears both young and old given his stature and age. He is an average-sized Toa with the typical purple-and-black appearance of the gravity people of the south, clad in black plate armor. He wears an obsidian Kanohi shaped like a Great Hau, clearly aged, and he has emerald green eyes. He appears world-weary, observant, and thoughtful much of the time. He wears white and beige robes as he roams the desert, and traditional garments when he visits the temples and villages. Weapons: One longsword and one throwing spear. Personality: Hakava is introspective, observant, thoughtful, reasoned, and moral. He is a philosopher and a humanitarian. He is compassionate and loyal. He will be honest, and he holds his associates to a high standard, but none higher than himself. He is equal parts skeptical of the gods and humble to the larger logos of nature. He values virtue, duty, and reasoned thought. While his lifestyle has given itself over to hermeticism in the past ten years, he is a cosmopolitan at heart and longs to be present in the world again. Weaknesses: Hakava is a thinker more than a doer, or so he has been for the past ten years. A battle is secondary to diplomacy, but he has trained in martial arts and gladiatorial combat. He is afraid of his past, as he can sense there has been a colossal tragedy and personal trauma there. He is a moralizer, and he will seek to live in accordance with the virtues, yet he can sense his forgotten heartbreak has led him down darker paths in the remote past. He dedicates himself to self-restraint and discipline. Background: Hakava originated on an island far to the south of Mata Nui, removed from much of Matoran civilization. Many of the details of his life before arriving on Mata Nui are shrouded, as he suffered a great bout of retrograde amnesia after he departed his homeland. He vaguely recalls life as a Matoran and philosopher/monk during the height of the Atzoul empire. Atzoul was a cult, and later a civilization, of Matoran dedicated to the virtues of Creation. They abandoned the mundane (used in the religious sense of worldly, daily affairs) culture of the larger mainstream Matoran populous and sought the sacred in the deserts of the far southern reaches of the known world. Braving treacherous, unknown lands, and having an eon to construct, they built an empire that flourished and thrived in harmony with nature. Hakava belonged to a sect of philosopher monks who consulted in government and spiritual affairs during the height of this empire, and he saw it collapse due to what he only knows was a great disaster. On the eve of the disaster, he laid himself in a sarcophagus and awoke a Toa. The remainder of that life is shrouded in mystery, even to himself. He has spent the last ten years largely in isolation, training, studying, and examining his purpose. He has spent much of his time on Mata Nui removed from global civilization, roaming the wastes of the Motara desert between Naho Bay and Leva Bay, as well as the Papa Nihil Reef. Literary & Historical Inspirations: Geralt of Rivia / The Witcher series by Andrzej Sapkowski; Marcus Aurelius and the main bulk of Stoic philosophy; Roman history; the Mediterranean and other classical history/culture. Edited by Dum Spiro Spero, Jul 16 2018 - 09:04 PM. Azza is a a Ba Matoran who has been lives in Ko-Koro for years. He came to the icy fortress to dedicate his life to meditation on the virtue of destiny and principle of peace. He's quite good at throwing disks and fairly strong for a matoran. His bottom half is purple while his top half is black, with an ebony Rau covering his face. Overall, he's a pretty average matoran. Unable to live in the Makuta-follower's occupation of Ko-koro any longer, he's abandoning his humble home with nothing but the pack of disks on his back. While unsure of what adventures await beyond ko-koro, he knows it's time for something new and definitely a change of scenery. No powers, just on the upper end of the strong spectrum, and good at disk throwing. Azza has spent years as an Acolyte, so he's kind of attuned to his surroundings and at peace within himself. Pretty much anything a normal matoran is weak to. Stoic, desire to succeed and the willpower to acheive his dreams, kind to strangers, avoids conflict. Hey for the record, I'm colorblind so if Azza's feet aren't actually purple let me know lmao. Baden is an ancient Toa, but he's only ever been in a cave. He became a Toa by Ame becoming a Turaga. Together, they've been stuck in a cave for so long they've lost track of time and most of their memory. Since he's lived in limited space, he has virtually no practice with exerting large amounts of elemental energy, however, he has expert-level control over lightning on a minuscule scale. He carries tremendous guilt about what happened, and strives to be the best Toa he can to make up for it. As a Matoran, he was an adventurer and treasure-hunter, and was always friendly. Powers: Expert-level control of Lightning and Electricity on a small scale. Practically no experience in real combat or large exertions of his element. Inquisitive mind. Kanohi: Axilia Blue and Silver Great Kualsi. Kanohi became Axilia when he was struck by lightning that partially caused the cave-in. (Approved by Ghosthands). Ame was once a Toa who was great friends with the Matoran, Baden in particular, but that was in the ancient years. He saved Baden's life when they became trapped in a cave, but in surrendering his Toa power to save Baden, he became a Turaga. He lay dormant for untold years with Baden, seldom waking up and training the new Toa and educating him. Ame always put great care in spending time with the Matoran and making them feel noticed and appreciated. He is a very kind-hearted and forgiving soul, and he fully understands the level of control and attention needed with wielding Plasma, which has motivated him to have above-average control over his element as a Toa. He is unsure what his new limits are since he has no real experience as a Turaga. Powers: Reduced mastery over Plasma. Selfless nature. Edited by Azibo, Mar 08 2019 - 09:27 PM. Movin' to Montana soon. Gonna be a dental floss tycoon. Casually looking to buy some Kanohi. PM me if you've got some neat ones please. 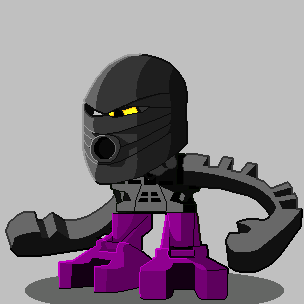 Description: A black matoran with hints of blue along the arms, and some green along the legs. (thes hints of blue and green are pretty small so it just looks like he has a black body) He wears a green kakama. Weakness(es): Occasionally takes too long to formulate an appropriate plan for the situation. History: A miner and mask maker predominantly located around onu-koro. Personality and traits: Tehtrax is a pretty, "brains over brawn" kind of guy. He like to think out his actions before doing them. This could be thinking of the correct trajectory to throw his kanoka disk or just figuring out what to say to start a conversation. 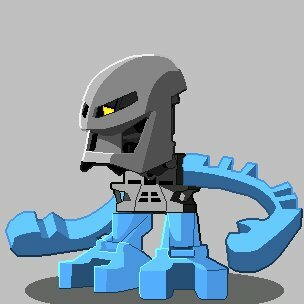 Description: A matoran with light gray torso, arms and legs. He wears a translucent grey kaukau. Powers: Like all de-matoran he has acute hearing. Weakness: Ears are very sensitive and can be hurt by excessive noise. History: A de-matoran that resides within ko-koro (as it is pretty silent there). He works as a chronicler and hystorian. Personality and traits: Like many ko-matoran Silos is very quiet around strangers and tends to avoid them as they may bring excessive noise. Many people call him shy however, he will warm up after some introduction. Edited by James Attack, Sep 19 2018 - 04:37 AM. Appearance: Grotesquely large (approximately eleven feet tall) and muscular with enough strength to bend protosteel without activation of his Parakuka, he has dark green armor with darkish red highlights and burning red eyes. He has an unnaturally high pain tolerance to the point of almost feeling no pain. His mouth has been elongated as to make a snout, his fangs interlock with one another, and his hands have been turned into large claws thanks to the Parakuka attached to him. 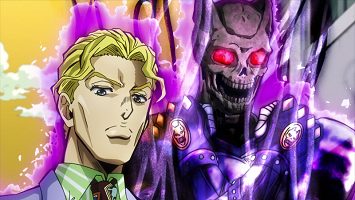 Furthermore his spine has been split into two rows to accommodate the parasite, every other spike in his spine has been fused with it's counterpart in the reciprocating spine to make a protective cage around the Parakuka. The Parakuka itself is of a darkish red color. History: As a young boy Zyrgahk was always fascinated by raw power, and would always try to become stronger, both physical and mentally. He had a habit of getting into fights with other Skakdi who were clearly far stronger than him and he'd pay the price for it. That never stopped him though, it wasn't worth fighting someone you knew you'd defeat. This tendency followed him throughout his life. As he got older he began training in all methods of combat and warfare becoming extremely skilled with his claw gauntlets, he would always exert more and more energy to the point of nearly destroying his body. In his mind all that mattered was power no matter how insignificant it might seem at the time. Knowledge, strategy, brute strength, anything he could learn. He became an expert fighter and strategist and would love to make show of it. One day he came across a Parakuka and trapped it in a cage. After days of studying it he realized it seemed to be a rather old Parakuka and knew the power it could give. He began to crave that power and decided that he would make that power his own, no matter the cost. In his mind to live free you needed power, power to overthrow anyone that would try to enslave you. Even if that meant living a shorter life, he'd rather live a short life wielding the power of a hundred Skakdi than to live a million years with a lesser power. He released the Parakuka and placed it on the back of his neck. The sudden pain was horrifying, his eyes felt like they wanted to blow out of his skull, and the electrifying pain of his spine ripping in two. His body began to grow in size, the feeling was that of being torn limb from limb in a slow agonizing pain. His teeth turned to fangs, the iconic grin was replaced by an etched scowl, and his hands became claws. The whole ordeal was excruciating it would be something he was never going to forget. He woke two days later with his memories shattered and fragmented. He had underestimated the age and power of the Parakuka, raw emotions and images were appearing in his mind. Instead of weakening each other by trying to fight with one another he simply tried to activate his new powers, but instead of just feeling stronger, faster, and more agile he felt like a wild animal who had been released from a cage, he could barely retain his sanity. Once the effects wore off however he was able regain some of his sanity, although he'd at times seemingly be talking to someone who wasn't there. Personality: Zyrgahk is cunning and crafty while the Parakuka isn't activated. He can be intolerant and at times harsh in his mannerisms. He can't stand weakness and will do anything to become stronger. When his Parakuka is active he loses all rationality and is basically a wild beast, if activated for long enough he might even turn on allies. Weaknesses: When Parakuka is inactive he is low on stamina, relying on strong blows to finish a fight quickly or his strength begins to lower slowly until he falls pray to exhaustion and sometimes even losing consciousness for a short duration before beginning to regain his strength. Even though he has a high pain tolerance it's not that he doesn't take damage he'll still receive the appropriate damage but he doesn't feel it as painfully as a normal Skakdi. Edited by The Forge of Artakha, Oct 31 2018 - 07:01 AM. (if it doesn't appear, it's pretty much my profile pic. Purple powerless Kaukau and arms, orange torso and black feet). POWERS/EQUIPMENT: Onu-Matoran strength and night vision, though a bit neglected due to leaving the enviroment. He carries a bag for supplies and whatever trinket he picks up (currently only has some rations, 5 discs and a small key he found in the middle of the desert and doesn’t know what’s for but found interesting). WEAKNESSES: Luntep is a ponderer. This means he’s usually armed with plans and arguments, but it also means he doesn’t have a lot of brain space to spare. Info-bombs tend to confuse him, affecting his performance. In the worst-case scenario, he might freeze in the spot until his mind processes what's happening. This is most exploitable when he's alone. ALIGNMENT: Lawful Neutral, as long as the laws make sense. When in doubt, he reasons his way around them. HISTORY: Luntep had spent most of his days in Onu-Koro, supporting the local inventor community with his thoughts. However, the big changes there eventually made him feel kind of useless. He's wandered through the desert for quite some time, looking for a place where he can ponder peacefully and join the crowd if he wants to. He's just arrived at Po-Koro, expecting to keep track about the rest of the island with their transmissions and what travelers tell (he's good at getting answers from them). All this pondering has started to tire him, so he's craving for a bit of interaction. PERSONALITY AND TRAITS: As previously insisted, Luntep is great at thinking. He can come up with some good ideas from time to time, but is not the type to carry them through by himself. He likes stability, and this decision to migrate was hard, so he hopes it's for the better. He's generally friendly and willing to help, but dislikes being interrupted. Occasionally he has these "bad days" when all he wants is loneliness. Most of the time, though, he's respectful of others, and he wishes the same respect in return.